Regular readers are aware that I spend an unhealthy amount of my time scouring through old VHS tapes in search of intriguing curios that haven't been seen in years. I've found a few interesting clips here and there, but nothing that was outrageously beyond the bounds of my imagination. 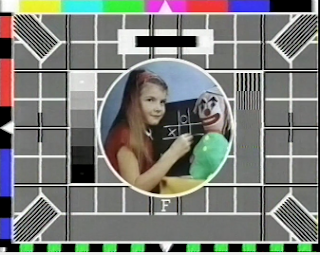 However, that all changed the other night when I found what appears to be a BBC engineering test. I was innocently working my way through a section of Channel 4's yoof culture show Switch when, during the middle of a Musical Youth video, the above appeared. Seeing as it had just gone midnight, it was a truly horrifying spectacle to be confronted by, especially with that perfectly-tuned-for-disorientation tone running throughout it. 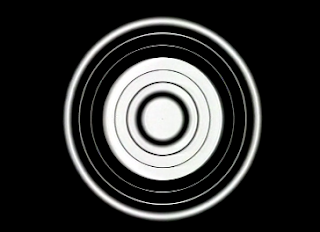 When I revealed the footage on Twitter, the majority of people thought it was either an alien communication or Japanese horror film The Ring made real. However, the most likely explanation is that somebody caught the engineering test - probably late at night - and grabbed which ever video was closest and recorded it before it was gone. 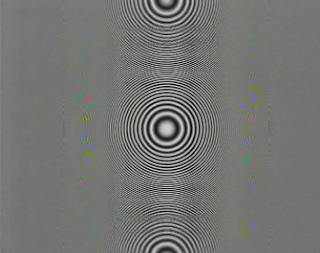 I've found a few random test card recordings in this collection of tapes, so it makes sense. What doesn't make sense, though, is the insanity on offer within the engineering test. It's so abstract, so surreal and so mind-bending that I decided to look at each section individually and try to describe what was going on. I don't know who this band are but, purely based on their shirts and guitar, I'm going to say they're Spanish. Or South American. What I do know is that they're on Blue Peter and I've been advised that the logo in the background was only used from 1986 onwards. It would be fantastic to hear what they're playing here as they're thoroughly enjoying themselves, but instead we're stuck with the tone from hell. 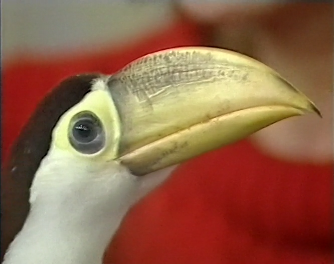 Is this toucan actually on the Blue Peter set listening to the lilting melodies of the aforementioned Spanish quartet? Unfortunately, I've got no idea, but he looks slightly bemused. I suspect a lot of this is because he doesn't understand why a large camera is pointing right in his face. No doubt he'd much rather be advertising Guinness. 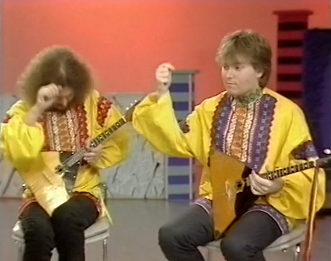 The band - I'm going to stop referring to them as Spanish in case I've made a huge cultural faux pas - are back and look at these two guys strumming away on their triangle guitars. Anyone know what these guitars are? Those sharp edges could be dangerous and it only adds to the trepidatious nature of this footage. 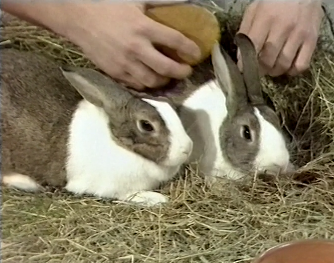 Here's a couple of rabbits being groomed by a mysterious hand and brush. These rabbits are more than likely long since dead and this only serves to ratchet up the eerie atmosphere. Surely the toucan is also dead, right? How long do toucans live for? Let me know in the comments below. Now this is definitely the Blue Peter garden, but was it before or after it was ransacked by Les Ferdinand and his unruly mates? Is that Carol Keating pushing a wheelbarrow? Who knows, but I do like that ornamental heron in the background. The most dizzying section of this engineering test are these bamboozling test patterns which no doubt mean something to a BBC engineer, but to you and me? 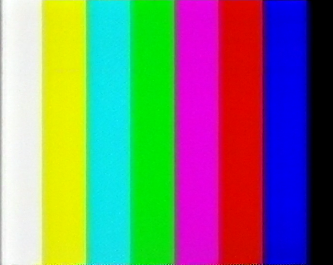 Well, I guess they're kind of colourful, but they're also capable of inducing monumental migraines. 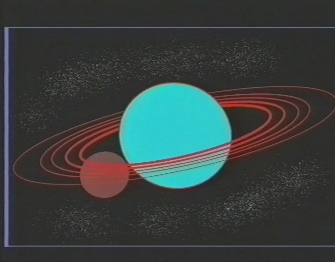 I'm not sure if this is supposed to be Saturn or if it's just a generic planet with a moon orbiting it. Nonetheless, it makes no sense in relation to anything that's preceded it or will follow it. Now that's a lovely tree. Just look at its bark and its many, many branches. What does it all mean though??! 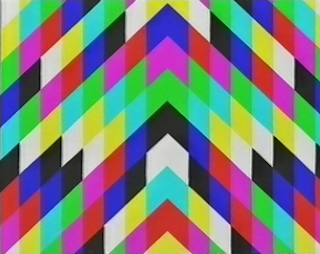 I'm not sure that anything sums up the 80s aesthetics more than this screenshot. I would LOVE to interview these curious souls and discover where the hell this piece of footage came from. Finally there are a few more test patterns guaranteed to send your eyes funny before it loops back to the start. 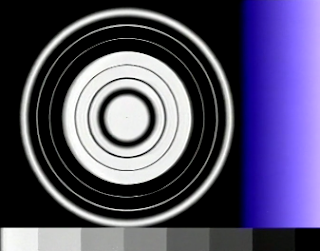 Does ANYONE have any ideas of dates for the footage above and what the test patterns are used to measure? Please get in touch below as it's a huge mystery. And well worth solving. 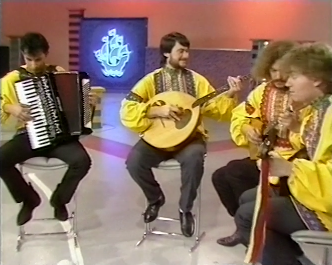 Yes, turns out they're probably from a late 80s Blue Peter episode which had a Russian theme going on. Brilliant find. Could be Percy Thrower in the garden as well. Fascinating clip. Thanks for sharing. I did a bit of searching on this and found that the shot of the couple is an EBU slide, rather than a still from video footage. 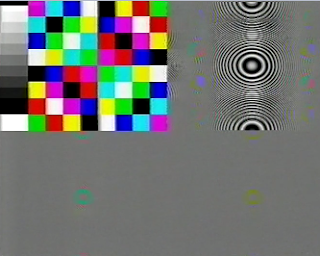 The shot was designed to show up PAL decoding artefacts such as cross-colour and dot crawl. These would be triggered by the fine monochrome detail on the couple's clothing. This BBC R&D report (published February 1980) gives some details on how the "Couple" slide was used to evaluate an experimental "clean PAL" system. Page 14. 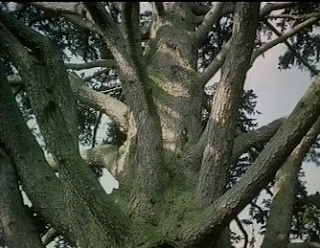 The 9th still (the tree) is another EBU test slide, again mentioned in the above BBC R&D report. 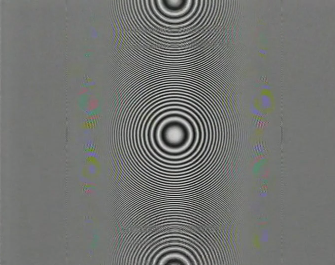 The author explains on p. 14 that the tree slide contains much fine detail, making it suitable for testing luminance resolution and cross colour. Thanks for the info, that's some good searching. Someone on Twitter had alerted me to the origins of the '80s couple' but not the tree. Good to understand a little bit more about the footage. Very odd indeed! It reminds me slightly of the Number Stations that used to broadcast coded messages.